GRANITE, Okla. (CBS/KWTV/AP) A convicted murderer locked up for killing an Oklahoma sheriff was caught posting pictures to his Facebook page from inside his prison cell using a smuggled-in cell phone. 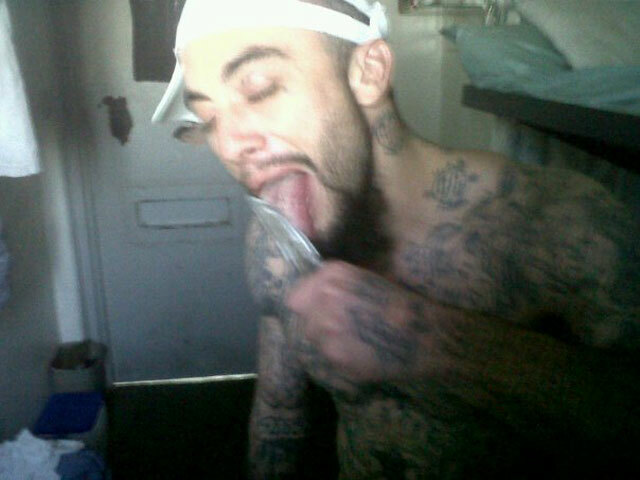 Inmate Justin Walker apparently used his blackberry to upload the photos onto Facebook. One photo shows him licking what appears to be a shank, while others show Walker smoking a joint, holding a bag of marijuana and a bottle of liquor. According to CBS affiliate KWTV, when the prison discovered it, they moved Walker from the medium security prison in Granite to the Oklahoma State Penitentiary in McAlester. Corrections Department spokesman Jerry Massie says officials also found marijuana in Walker's cell and that he is now segregated from other inmates. Massie says Walker could face felony charges. Walker is currently serving a 30-year prison sentence after pleading no contest in 2006 to second-degree murder in the 2001 shooting death of Pawnee County Sheriff Dwight Woodrell.